Buy this book This item is normally dispatched within 1 working day and should be with you in 2-3 days (for UK addresses). Although lighting products are becoming more efficient, the energy used for retail lighting has increased due to longer opening hours and higher light levels. Reducing energy consumption for retail lighting can directly increase profitability and reduce environmental impacts. Modern lighting techniques and equipment, as well as more efficient light sources, provide opportunities for significant reductions in the use of energy, while achieving a greatly enhanced level of illumination and improved visual appeal. 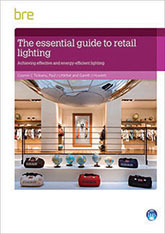 This guide reviews current practice in retail lighting and gives advice on how to achieve energy savings, providing retailers, architects and designers with practical guidance on both refurbishing existing lighting systems and developing new lighting solutions for their stores. This item is normally dispatched within 1 working day and should be with you in 2-3 days (for UK addresses). Want it now? There is also a PDF version of this title available as an instant download here.